Organic farming in India is gaining popularity day by day. One can get organic certification by strictly following organic farming methods. Organic produces have great market value and demand. Learn what is organic farming and how you can convert your land into a certified organic farm. Organic farming is a system that avoids or excludes use of synthetic inputs like pesticides, fertilizers, hormones, etc. and relying on techniques like crop rotation, organic wastes, farm manure, rock additives and crop residues for plant protection and nutrient utilization. Thus, in other words, organic farming is relying on the natural process of yield benefits so as to maintain a healthy soil, eat healthy food and grow healthy humans. There is a difference between organic farming and permaculture. The later depends on organic farming but it also includes lifestyle into organic gardening or farming. Ever increasing population as opposed to an ever decreasing supply of living resources like food and water has made it necessary to increase the agricultural production and stabilize it in a viable and feasible manner. The benefits of ‘Green Revolution’ credited to Dr. MS Swaminathan have now reached a plateau and with diminishing returns it has become necessary to devise alternate techniques. In addition, the excess use of fertilizers and artificial growth regulators has led to an issue called ‘pollution’. The need of the hour is a natural balance between life and property for existence. Keeping in view the fact that fossil fuels are on their way of extinction and are non-renewable, organic, nature friendly ways of farming and agriculture has gained importance. Soil is a living entity. Nature is the best teacher for farming since it does not use any external nutrients or additional water. Organic farming is based on understanding the ways of nature. It does not mine the soil of its nutrients nor does it degrade the soil for fulfilling the needs of the common man. The living population of the soil is protected and nurtures. The natural micro-organisms in soil are not harmed in any way. The focus in organic farming is the soil itself. The health of the soil and its structure is maintained as it is believed to the most important medium. Thus organic farming is a system of farming that aims at keeping the soil alive, maintaining its good health, cultivating the land and then raising the crops. This must be done to maintain a pollution-free environment and in an ecological manner. Using legumes to fulfill the nitrogen requirements of the soil. Managing diseases, pests and weeds through the use of techniques like natural predators, organic manuring, crop rotation, maintaining diversity, growing resistant varieties, etc. Effective livestock management by paying special attention to their nutrient requirements, housing, breeding, rearing, etc. For farmers living in a no-input zone, organic farming is a way of life. It has been practiced by them since ages and is a traditional way of doing agriculture. In wake of the ill-effects of conventional agricultural practices and owing to the misuse of fertilizers, farmers who have recently adopted organic farming fall under this category. This category includes farmers who have systematically adopted organic agriculture to capture the market commercially. Most farmers fall under the first category but they are not certified farmers. Certified farmers are in the third category while both certified and non-certified farmers are included in the second category. Since India has traditionally been practicing organic farming, there is a regulatory body that ensures quality. National Program on Organic Production (NPOP) is the authority defining the regulatory mechanism. They have two different bodies for regulation in the domestic and export markets. Under Foreign Trade Development Regulation Act, NPOP looks after the export requirements. Under Agriculture Produce Grading, Marking and Certification Act, it looks after the domestic market and imports. Agricultural and Processed Foods Export Development Authority (APEDA) is a regulatory body of NPOP as per FTDR Act. It is also the Agriculture Marketing Advisory under Agricultural Ministry. The NPOP notified under FTDR act is equivalent to USFDA, European Union and Sweden. Hence, products certified under NPOP can be exported to US, Europe and Sweden without the requirement of an additional certification. There are 18 agencies accredited by National Accreditation Body that look into the certification processes. 4 of these agencies fall under the public sector while rest 14 is managed privately. 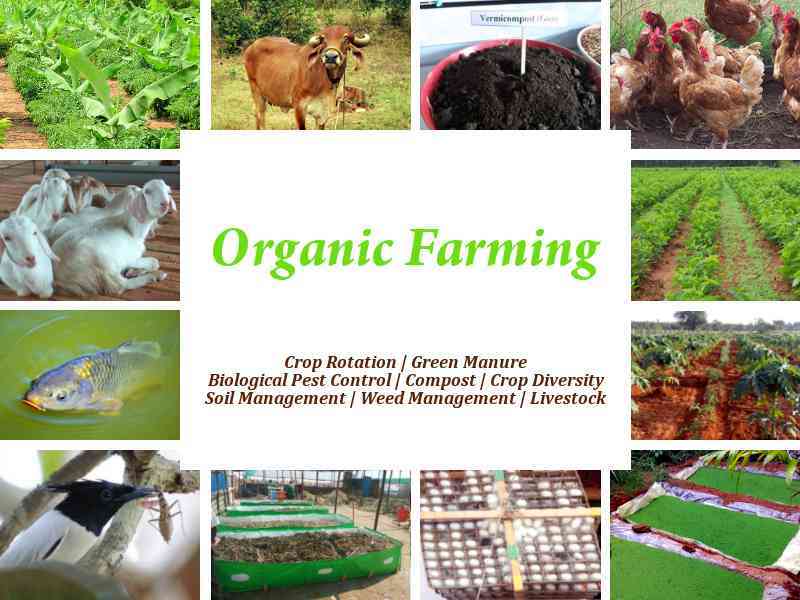 Since the entire concept of organic farming revolves around a healthy, living soil crop residue management, effective crop rotation, proper cropping patterns etc. must be practiced carefully. This ensures optimum productivity without any fertility loss. In addition, organic systems also respect the natural ecology of the area such as the weather, flora and fauna of the place, the native animals there etc. Poor soil health due to loss of organic matter and soil microbes. Costly high inputs as opposed to lower returns. Rain water harvesting is an important step in organic farming considering the fact that the only source of irrigation are the seasonal rains, local ponds, lakes, and wells. Therefore, percolation tanks, farm ponds must be dug and cultivation must be practiced in bunds or contours. Since soil is a living entity, it must be enriched to the maximum extent. The golden rule here is to circulate the crop residues, cattle droppings, and every other biological waste back to the field. Every biological waste taken away must be replaced in the field. In other words, every nutrient, waste, and other resources from the field is accountable. In case of soils deficient in nutrients, mineral grade rock phosphate and lime are added through composting or directly. Bio-fertilizers, compost, bio-nutrients etc. must be used. Synthetic fertilizers, artificial nutrients etc. are a strict no-no. In wake of ever-increasing temperature and ill-effects of global warming, this is an important consideration. The soil must be kept covered to protect it from heat. Trees and bushes must be planted on the bunds. Renewable and eco-friendly resources of energy like biogas, solar energy, etc. must be used. For machinery, bullock driven pumps and generators are used. Scheduling of crop plantation must be done by effectively using crop rotation throughout the year. The natural habitat must not be destroyed or disturbed with through the use of pesticides and other such synthetic chemicals. Animals are very important from the point of view of farm management since they are integral in keeping the good health of the soil. Cow dung and poultry droppings are very good raw material of organic manure. 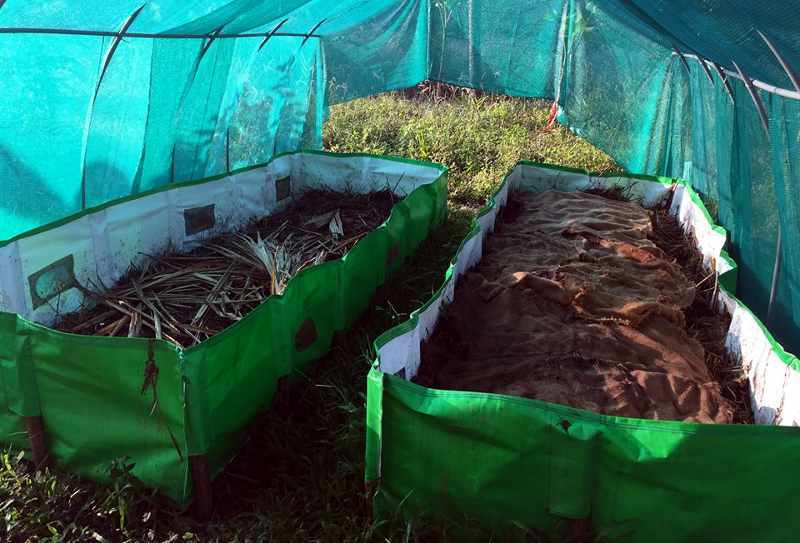 Using techniques like vermicomposting, developing own seed varieties, farm compost production, using botanical extracts and liquid manures are other ways of organic farming. If the farmers are practicing conventional farming and the field is not fully organic then the farmer must have a conversion plan. The time interval between the beginning of organic operations and certification is the ‘conversion’ period. The exact time period is decided taking into consideration the ecology of the land and its previous use. Conversion period is also applicable if the field is partially organic. However the organic and inorganic fields must be clearly marked and maintained separately. Gradually, over a period of time the entire farm including the livestock must be converted to organic. On an average, the conversion period is three years for perennials and two years for annuals. This is a practice of agricultural farming wherein there is not just cultivation of crops but also other farming such as animal husbandry, sericulture, pisciculture or fish farming, poultry management, etc. In other words, mixed farming is integration of animals into the farming system to ensure soil fertility and crop yield. Since soil is the essential component of organic farming it is necessary to maintain the health of the soil by practicing effective crop rotations and patterns. Growing the same crop in the field repeatedly must be avoided as this would affect the soil fertility. Cultural practices like intercropping would help soil maintain its vitality. Some people cultivate turmeric, ginger, sweet potato, etc. Mango is often intercropped with elephant foot yam, sweet potato and cassava. Vegetables like cabbage, radish, cucumber, is intercropped with maize. Pepper and onion are often grown together. 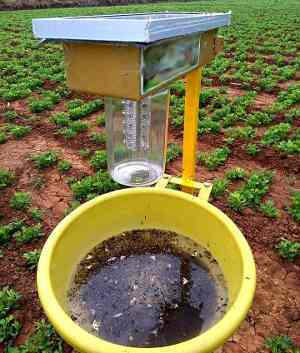 These practices ensure that the nutrient value of the soil is not lost. In addition, inter-cropping helps in disease and insect pest management effectively. Often farmers forget that they must plant what the weather, climate and soil of the area allows. They must cultivate what is native to the soil. In case otherwise, the species or variety chosen for cultivation must be adapted to the soil. The planting material and seeds must be procured from a reliable source that is certified organic by the authorizing body. In case ‘organic’ ones are not available then chemically untreated planting material should be used. Pollen culture seeds, tissue culture seeds, transgenic plants, genetically engineered seeds are also not allowed. Bacterial-based bio-fertilizers like Rhizobium, azospirillum, etc. The above products are used only when absolutely necessary. A host of factors like nutritional imbalance, contamination, depletion of natural resources must be taken into account. It is also advisable to contact the certifying agency before using urine, straw, slurry, etc. from other farms. The best way to overcome this is starting a small scale dairy farm which will reduce the cost of organic input and make sure the timely supply. Crop pests have some natural enemies like Micromus, Coccinellids, Syrphidae, spiders and campoletis. Studies have shown that coccinellids reduce leafhoppers and spiders twice as efficiently in crops like potatoes, maize, cotton, groundnut and soybean. Spiders are also effective for the said crops in controlling many insects. Cost of farm input reduces by using crop and animal residue, organic waste as bio-fertilizer. Market value and demand of organic product is high compared to traditionally grown farm produces. There is also a very good export potential of organic produces but organic farming methods must be strictly followed and along with organic certification from authorizing body. To conclude with, organic farming in India is a safe venture although it may take a while to establish and become fully functional. There are government subsidies available for the commercial aspects. If organic farming methods can be strictly followed, required organic certification is acquired and have access to the right market then organic farming in India is very profitable. This helped me a lot in my project and there are many informative points which i could use for my project. Hello sir I am interested in organic farming in my land, but I have no knowledge about organic certification and about buyer and sellers. So please give advice. If you want to start commercial organic farming then contact our experts.